NCIF is the only investment fund focused solely on the mission-oriented banking industry. Our strategy is to drive economic development in low-income communities by investing equity in vital local financial institutions. The powerful impact created by financial products and services provided by these banks make them Too Important to Fail. We also work with socially responsible, mainstream, and philanthropic investors to co-invest capital and place deposits where they matter most. Mission-oriented banks can improve their financial sustainability through a number of NCIF’s innovative business opportunities. Our New Markets Tax Credit Program allows banks to book loans and generate income through catalytic development projects in their local communities. NCIF is exploring several new initiatives, including our Small Business Transaction Initiative and the emerging CDFI Bond Guarantee Program. Are you an impact investor interested in promoting community development and fair access to financial services? 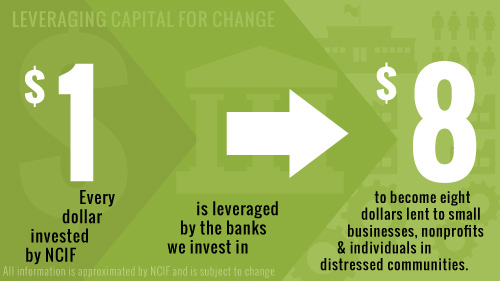 Learn about NCIF’s Custom Analysis for placing or monitoring impact investments in banks. Mission-oriented banks interested in becoming investees or participating in one of our programs can learn more about our investment criteria. Contact us for current opportunities.